NFL veteran Chris Draft has spent the last 13 years of his life tackling some of the toughest and biggest opponents in the National Football League. Now, Draft is being honored for tackling literacy and health disparities in the community through his work with The Chris Draft Family Foundation. Capital Cause, a nonprofit dedicated to providing an avenue for young professionals to give back creatively to local communities, recently honored Draft and others during the Political Fusion reception in Washington D.C.
Capital Cause’s Political Fusion networking reception honored Draft with the organization’s “Unsung Hero” award for his service to the local community through the Chris Draft Family Foundation and his commitment to literacy through the launch of his children’s book, “Do You Want To Play Catch?” and work with literacy awareness groups nationwide. Draft established the Literacy Leaders™ initiative, which is a network of people dedicated to “changing lives, saving lives, one book at a time” through promoting literacy and encouraging reading as a means of addressing the nationwide learning disparity. The foundation also focuses on a number of key initiatives including character building, asthma awareness and community service. 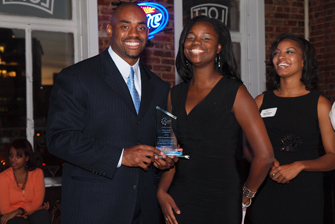 “The Chris Draft Family Foundation is focused on creating a better person in every aspect. Whether it’s a personal development program or a fitness program, we are there on the front line working with youth and families in cities throughout the United Stated,” stated Draft. Capital Cause also recognized Rep. Yvette Clarke (D-NY), who has had a commitment to the advancement of young professionals and has championed a platform that serves low-income children and families, and actor and writer, Hill Harper who has a commitment to young professionals and charitable and political contributions to society. Partnering organizations include the National Black Graduate Student Association, Women. Politics. Media., Red Carpet DC, E.S.T. Unity, The Dale Consulting Group, Apathy Remedy, Exemplary Editing, The Actorvist Project, Acts of Faith in Love & Life, Hell in a Handbag, and Circle 7 Entertainment.